Fantastic range of games and sports betting opportunities. Great slots software supported by valuable bonuses. Our Rich Casino review takes a look at the nuts and bolts behind the glossy exterior of the casino´s website to help you determine whether or not this is a worthwhile venue to invest your time and money. On first appearance, the casino has plenty of games and masses of promotions. However, it is no exaggeration to say there are plenty of nuts and bolts to explore! There is a multitude of terms and conditions to absorb relating to bonuses, sports betting and general use of the website. The shouldn´t put you off. Indeed, it is refreshing that an online casino makes its terms of service so clear. Remember, you are bound to the terms and conditions of the casino whether you read them or not. We recommend you read them – all of them! The first thing to mention in our Rich Casino review is that the casino software can be played in a web browser (some games require the latest version of Flash to be installed) or downloaded onto a PC. The downloadable version of the software is marginally better, and the link to access the download is near the foot of the casino´s Home Page. The casino will identify the operating system you are using. Rich Casino has been online since 1999 and claims to have more than one million registered players. We wouldn´t be surprised if that claim were true, as the casino is the flagship brand of the Curacao-licensed Engage Entertainment Group and offers the widest range of software providers than any of the group´s other sixteen online casinos. The casino group has a very commendable approach to responsible gambling and trains its employees to look out for signs of problem gambling. In addition to the “reality check” online tools that keep account of how much time and money is spent on the site, Rich Casino also provides account controls, self-exclusion tools and experienced 24/7 help available through live chat. The primary attraction to the site however – and the reason we included a Rich Casino review among our selection of casino sites – is the quality of the software. The casino´s software providers include Betsoft, Microgaming, Rival Gaming and NetEnt, among some providers that players may be less familiar with, but that provide a marvelous online gambling experience. At the time of compiling this Rich Casino review, the casino is offering twenty-five free spins on selected slots when you create an account. The casino frequently offers free spins and bonus money promotions and there is no deposit required to take advantage of these promotions – as soon as you have registered your account, the free spins or bonus money are credited and you can start using them right away. If you win with your free spins or bonus money, there are restrictions on withdrawing your winnings. There is a limit of $100 on how much of the winnings can be withdrawn, and only once you have completed a 75x play-through requirement. You also have to make a real money deposit before you can request a withdrawal, at which point any winnings from the sign-up bonus above $100 is forfeited. It´s not a bad offer inasmuch as you have nothing to lose from creating an account and you could win up to $100. It is a withdrawable no-deposit bonus offer, which many online casinos do not offer, and subsequent free spin or free bonus money promotions from Rich Casino are not usually withdrawable. Remember to read those terms and conditions each time. The Rich Casino bonus for new players is a 200% match bonus on your first deposit (minimum $10.00), a 100% match bonus on your next three deposits, and a 175% match bonus on your fifth deposit. The bonus is cleared by playing through the deposit and bonus amount thirty-five times, but please note only your deposit and winnings are withdrawable – not the free casino bonus money. If you are Bitcoin-aware, you can benefit from an even larger bonus. When you make your first three deposits using Bitcoin, you will be eligible for a 400% bonus on each. The same clearing requirements apply as for the Rich Casino bonus for new players, and please note you cannot withdraw any of your funds until the bonus requirements are satisfied. You cannot fault the casino for its game selection. Using eleven different software providers, Rich Casino offers a choice of 163 classic and video slots games, 80 video poker games, a live dealer casino, a choice of 14 table games and 5 “other” games such as Keno, Casino War and Weed Whacker. You can also bet on sports and the financial markets using the same account. Given such a wide diversity of software providers, some of the games are better than others when it comes to player experience. Fortunately you can test out the games in play mode before investing any real money into them to find out which you like best. You can also sort the games by provider if you have a preference for Betsoft games over NetEnt games or vice versa. In our opinion, there are a lot of good slot games at Rich Casino. We were delighted by the selection of video poker games and the choice of live dealer options (not available in play mode), but a little disappointed in the limited selection of table games. The volume of sports betting opportunities more than made up for our disappointment! 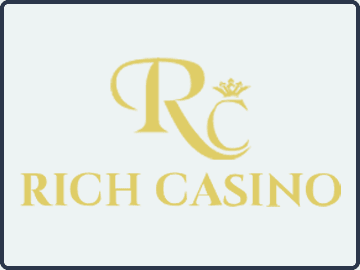 The banking options at Rich Casino vary according to your location. Generally you can fund your account with a Visa, Mastercard or Amex credit card or use Bitcoin. In some jurisdictions you also have Neteller, Skrill, EcoPayz, PaySafeCard and flexepin options – all of which are free and all of which are instant. You can request other deposit options (check, wire transfer, etc.) via Live Chat. As far as the security of your funds are concerned, all deposits and balances are held in a separate account, and all transactions are conducted with 1024-bit encryption (higher than industry standard encryption). You will be required to verify your identity before requesting a withdrawal, and renew your verification details every six months. Few sites take player security this seriously. Withdrawals are processed within five days on average. Although no facility exists to withdraw by Bitcoin at present, you can choose to cash out using wire transfer, check or echeck. There are modest fees attached to each withdrawal method and limits on how much you can withdraw each week depending on your status in the Rich Casino VIP Club. The Rich Casino VIP Club is a six-tier loyalty program in which you climb the statuses by earning points as you play games at the casino. Once you get beyond the ground floor of the VIP Club, benefits include birthday and anniversary bonuses, a points-for-cash exchange program, and higher bet limits on games. At the highest level, you will also be invited as a guest of the casino to exclusive live events. As with all our online casino reviews, we are going to end our Rich Casino review with some of our “likes” and “dislikes”. Although they are our “likes” and “dislikes”, we have a pretty good understanding of most players´ motives for choosing an online casino. We feel most other online gamblers will agree with us once they have spent a little time at Rich Casino. Amazing selection of software providers resulting in a fantastic range of games. Bonuses available every day to encourage smaller deposits and responsible gambling. Incredible customer support and player security, and tools to prevent problem gambling. Was not keen on the software driving the table games. The wagering contribution for Blackjack is disappointing low. Status-limited withdrawal restrictions can make cashing out a pain. It took a lot of reading terms and conditions to compile this Rich Casino review, but it was worth it. We went into testing the casino with our eyes wide open and knew what to expect in terms of bonuses, clearing requirements and withdrawal limitations. It was time-consuming, but so was checking out which games to play from the huge selection available. We often write in our review conclusions that an online casino is more suitable for a particular type of person (recreational player, high roller, etc.). We think we shall end our Rich Casino review by saying that there is something for everyone at the casino; but – like us – you might have to invest a little time looking at the nuts and bolts of the site before you invest any money.